We've taken our ultimate brownie recipe and added a specially made layer rich with Proper Nutty peanut butter. 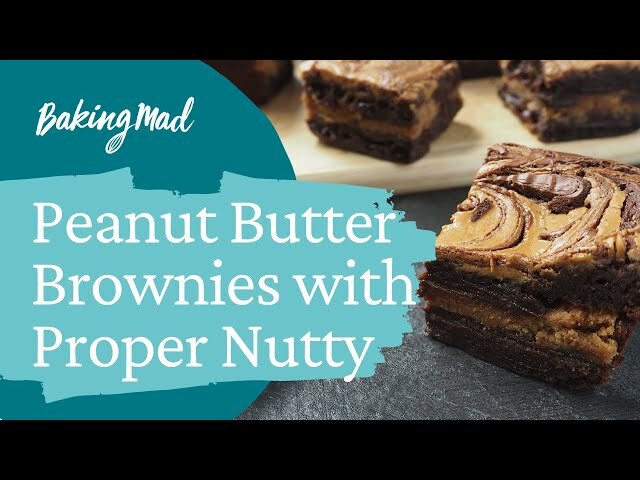 We've swirled it into the top making a beautifully sweet chocolatey peanut butter dessert. This isn't one for the faint hearted! Preheat the oven to 190ºc/170ºc fan/Gas 5. To make the cake mix, melt the chocolate and the butter together in a large bowl over a pan of simmering water. Once melted, allow the mixture to cool slightly. In a separate bowl whisk together the eggs and sugar until there are no lumps. Mix in the chocolate mixture and then the flour until you have a smooth batter. Set aside while you make the filling. Mix the peanut butter, icing sugar, vanilla and milk until you have a stiff mixture. Roll this out between two pieces of baking parchment until it is about 20cm square. Pour half the cake batter into the tin, then lay on the peanut mixture - it doesn’t matter if it breaks, just patch it together - and then cover with the remaining batter. Finally dot with the 60g peanut butter and then swirl it with a dining knife, taking care not to go as deep as the peanut butter layer beneath. Bake in your preheated over for 30 minutes. Allow to cool completely in the tin before cutting.